We've got a few dings and dents around Hullabaloo, some from us, some not. They kind of drive me crazy every time I see them and I"ve wanted to get them fixed but wasn't sure exactly how to go about doing it and wasn't sure how much work it would take. So I just put up with them. Then this past summer I found this stuff online that was supposed to be a super easy, super quick fix for fiberglass chips. I watched the Youtube clip and read reviews and, naturally, as I was trying to buy it I found out that it was only sold in Australia at the time. I begrudgingly moved on, but made a mental note to look it up before we left, hoping that it would be available here. As I've heard over and over in the sailing/cruising world; things have a way of just working out. It must be true because wouldn't you know it, a couple months later I get an email offering to let us try the same exact stuff out! Uh, yes, yes I would like to try it. 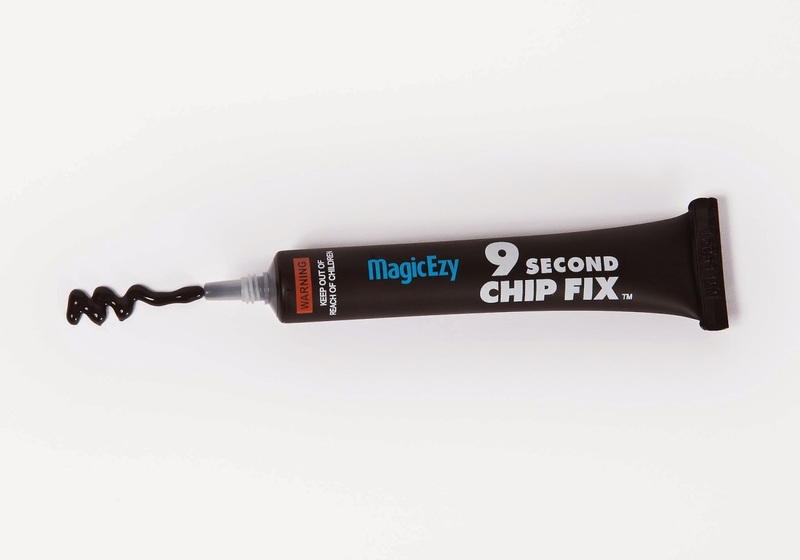 MagicEzy is a manufacturer of a unique range of ‘world first’, nano-technology-based surface repair products that provide solutions to time-consuming and difficult DIY surface repair problems. We were asked to complete the review by the end of the year and time was tickin', fortunately we have been having a bit of a warm spell lately so we took the chance to get up to the boat and try it out on a couple of our numerous chips while the temps were in the right ballpark. We followed the directions, except for using the hairdryer/heat gun to heat the area and/or dry it. We sort of forgot the extension cord. Oh, and we couldn't find the heat gun either. I tried squishing and squeezing the tube to mix up the contents before using it but was left with some inconsistent consistencies when I tried to initially apply it. So I wiped of the area, squeezed some into a paper towel until the consistency seemed to even out and reapplied. Ezy peasy. Although my leveling abilities left a little to be desired, I think it came out pretty well and am very happy with the color match. With Hullabaloo's creamy color I wasn't sure how well the cream color I chose would match, but match it did! We didn't sit around and wait for it to dry so we'll have to check out the final product next time. A little blurry but it matches! There is plenty of the chip fix in the tube to patch up our current and future chip-fixing needs and will undoubtedly be coming along with us on our travels. I'm also looking forward to trying out the Hairline Fix product on our hairline cracks around the mast, stanchions, all over really, I'll keep you posted on that! Holy smokes. This would be awesome on Luna Sea. Can't wait to see how it does on your hairline cracks! Did you ever use the hairline crack product? Are you still happy with the results? We haven't gotten it yet. I'm not really sure we will, but if we do I'll do a post about it!